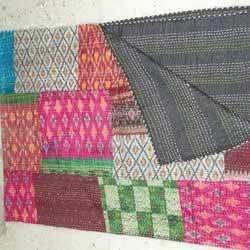 Pioneers in the industry, we offer old sari kantha quilt, vintag silk kantha quilt, vintage kantha quilt, reversible bedding kantha quilts, bedding vintage kantha quilt and antique kantha quilts from India. 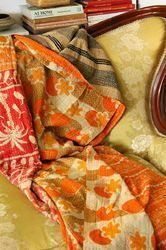 This is Old sari kantha quilt and we deal in Decorative throw pillows, bedding pillows, wall hangings, and window curtains, each of these home accessories, when used in the right way, can bring a home decor scheme together perfectly. Used to break up what may be boring expanses of upholstery or wall space, the very existence of decorative pillows and home accessories makes a room personal, comfortable and trendy. Our funky decorative pillows and our unique home decor accessories are designed by our in-house designers in collaboration with rural artisans. Sure to add pattern, color and funky flavor to any room, transform your home with decorative pillows and home accessories from Vishal Handicraft. 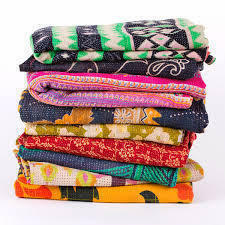 Vintag Silk Kantha Quilt made by Indian village women, they collect her some old sarees and cut and match the fabric and color than stitched by hand and make some new in handwork. India is a very creativity country here we found some different culture, is this quilt made by recycle and get look peaceful. 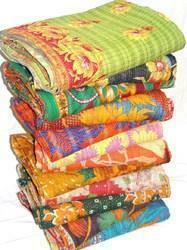 This is Vintage Kantha Quilt. This work is done in West Bengal that provides work and livelihood for women in Calcutta's slums. 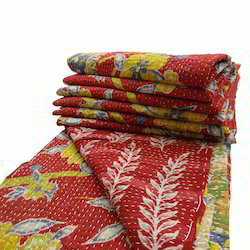 The entire quilt is painstakingly embroidered with thousands of small and delicate kantha stitches to create a one of kind masterpiece!It is reversible, can be used from both sides and both sides have different patterns.It is made from vintage old cotton saris and softly quilted.It is embroiderd by artisans in West Bengal. 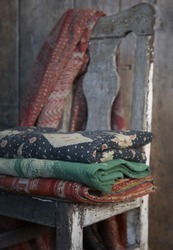 This is Reversible Bedding Kantha Quilts. This work is done in West Bengal that provides work and livelihood for women in Calcutta's slums. The entire quilt is painstakingly embroidered with thousands of small and delicate kantha stitches to create a one of kind masterpiece!It is reversible, can be used from both sides and both sides have different patterns.It is made from vintage old cotton saris and softly quilted.It is embroiderd by artisans in West Bengal. 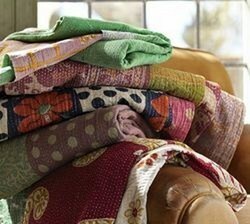 This is Bedding vintage KanthaQuilt. This work is done in West Bengal that provides work and livelihood for women in Calcutta's slums. 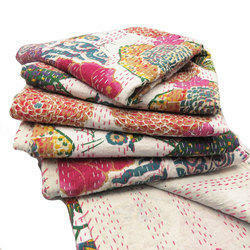 The entire quilt is painstakingly embroidered with thousands of small and delicate kantha stitches to create a one of kind masterpiece!It is reversible, can be used from both sides and both sides have different patterns.It is made from vintage old cotton saris and softly quilted.It is embroidered by artisans in West Bengal. 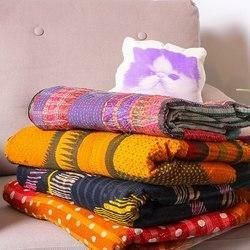 This is special hand crafted Kantha quilt. This work is done in West Bengal that provides work and livelihood for women in Calcutta's slums. 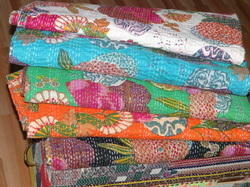 The entire quilt is painstakingly embroidered with thousands of small and delicate kantha stitches to create a one of kind masterpiece!It is reversible, can be used from both sides and both sides have different patterns.It is made from vintage old cotton saris and softly quilted.It is embroiderd by artisans in West Bengal. 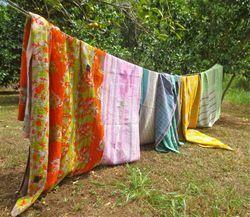 This is Fruit print kantha quilts. This work is done in West Bengal that provides work and livelihood for women in Calcutta's slums. The entire quilt is painstakingly embroidered with thousands of small and delicate kantha stitches to create a one of kind masterpiece!It is reversible, can be used from both sides and both sides have different patterns.It is made from vintage old cotton saris and softly quilted.It is embroiderd by artisans in West Bengal. 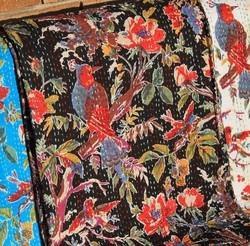 This is Reversible Bengali throw Quilt . This work is done in West Bengal that provides work and livelihood for women in Calcutta's slums. 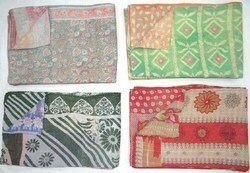 The entire quilt is painstakingly embroidered with thousands of small and delicate kantha stitches to create a one of kind masterpiece!It is reversible, can be used from both sides and both sides have different patterns.It is made from vintage old cotton saris and softly quilted.It is embroiderd by artisans in West Bengal.